Book presentation / 40 years of Kayak!!! 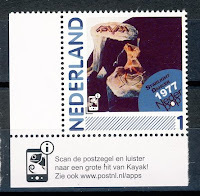 On 21 september 1972, a young band in Hilversum decided to name themselves Kayak. Exactly 40 years later, and about 100 meters from where they recorded their first demos, there was the official presentation of the book "Kayak - 40 years". Rock venue "De Vorstin" gave home to the band, friends and relatives, fans, people from the press etc. 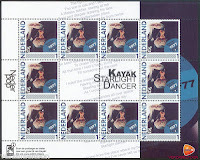 From the rich past of Kayak I noticed: Peter Scherpenzeel, Gerrit Jan Leenders and Marjolein Teepen. Chiel van Praag, who played with Pim and Ton the late sixties, did an interview with Ton and Irene about the book. Then, there was a chat with Ton, Irene and Gerrit Jan, and the official 'first copy' of the book was handed over to the couple. The official part was followed by a short Kayak performance, that gave us a hint of the upcoming tour. They played the 40-year old "Hope For A Life", "Phantom Of The Night", the brand new tracks "She Rules My World/Cleopatra", "Before The Angels Fell" and "Ruthles Queen". Brilliant! After the performance, it was time for the fans to pick up their books. The new Cleopatra/Symmetry-EP was also for sale for the first time. And as a bonus, every buyer of the book received a free t-shirt. Enough time was left for having the books signed, and for a chat and (free!) drinks and snacks. Many thanks to Kayak and their publisher for this nice gesture! During the making of the book, I offered Ton and Irene some pictures and other items from my collection. I feel honoured that they mentioned me in their "thank you's", and to see quite a few of 'my' material in the book. This year, Dutch postal services PostNL released a series of stamps dedicated to "Nederpop", Dutch music from the 1960's until the present day. 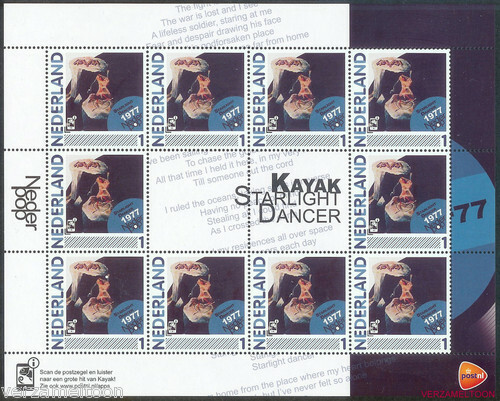 In march, they released a stamp with "Starlight Dancer". Through an app connected with the stamp, it was also possible to hear a snippet of the actual music. As far as I know, the stamps were only available through a "collector's subscription", and were not for sale at post offices etc. On 5 may, Kayak played a festival in Alkmaar. That same day, they were supposed to appear at the Legends Festival. But alas, that festival was cancelled. Or rather: postponed, as it now took place on 16 september. The location was a beautiful park in the city of Apeldoorn. Around 5,000 people turned up to watch classic Dutch bands like Focus, Brainbox, Massada, Gruppo Sportivo and Time Bandits (to name just a few!). Kayak had the honour of closing the day, and they did that quite good. The setlist had no hints of the upcoming "Journey Throuh Time"-tour. It was almost the same as in may, but due to time limitations, "Bury The World" and "Anywhere But Here" were skipped. The crowd appreciated Kayak's powerful show. The sound was not perfect, at least not where I stood. But people who stood more at the back had better sound, so I was told. I am sure you will find more nice pictures on the Internet! And now it's on to the book presentation, and the start of the "Journey Through Time"-tour!! !